Well, Happy late Valentines day. I did nothing romantic or even with a boy on Valentines Day. That night my mom called me up and asked if I wanted to go out to dinner with her and my dad. Since I obviously had no plans or a hot date I went. I then came home,watched TV and played on the computer and went to bed. I made sure to give each of my doggies a big hug and kiss and told them how much I love them, that is how I spent my Valentines Day. Onto the good stuff... I had a totally horse filled weekend and it was awesome. My roomie and I scheduled a lesson with the barn owner. It will be my first official lesson in about 5 years, since I graduated college. I figured it was about time and since I had a little extra cash it was a perfect way to spend it. So Friday in preparation I wanted to give Possum just a tune up and get his muscles working again since he had about 5 days off since our last ride. I thought he might be a little hyper, but I was totally wrong. He was sluggish to start, was behind my leg which I HATE and rather pissy. By the end of the ride he had warmed up out of it, but what was going to be a 30 min ride turned into a 90 min ride, with jumping and turns and flying changes and circles etc... Since he is not clipped it took a couple hours for him to cool out to put his blankets on and throw him back outside. After taking care of our horses the roomie and I went to the movies to see Crazy heart. Really liked the movie, and want to buy the soundtrack, I liked almost all of the songs. It's a slower movie, no big action or anything, but I'm not a big action movie fan anyways, I like movies that make me think and feel, and this was a good one for that. So Saturday I ate a big late breakfast and got dressed in breeches and tall boots and wore a vest that would match my saddle pad. I know it sounds crazy, but when I was taking lessons in school it was a serious business. You had to dress like you were showing, minus the jacket and shirt. Your boots and britches had to be clean and everything had to be perfect down to the horses grooming and leg protection. No joke, the riders and horses were both "inspected" when our trainer arrived to make sure everything was correct, and if it was not right you could be kicked out of the lesson for the morning or told to completely untack the horse and start over. Ypu didn't mess with the trainer, and since were were ridig horses who were worth more than us, we did what we were told, so that has just been ingrained in my head. The lesson went really well. We worked on some lengthening and shortening of strides on a 20 m circle with poles set out, trying to get 4 strides, 5 strides and the 3 strides. We actually managed to get he 4 and 5 strides relatively easy but the 3 was a little crazy. I kept trying to throw him away and losing the contact and he would just speed up more and not necessarily lengthen his stride. 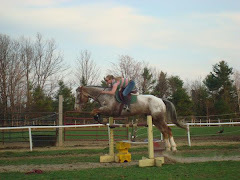 I thinkn the exercise was a lot harder on a circle then it would have been like on the long side of the arena. It was a good lesson for both of us. I also worked on not throwing the contact away while jumping a fence. I tend to give him too much rein, and now that we are more advanced I need to use a following hand more often to keep the contact so that on the landing of the jumps he comes back to me sooner and that leaves more time to prepare for the next jump or turn. Lastly we worked on rhythmn and pace in a sinple 2'6' line working on my position and the overall picture. We ended the lesson on a good note and both Possum and I were puffing. It took a long time to cool him out since he had worked up such a good sweat, after walking our horses out and covering them with a cooler, we left them int eh barn with some hay while we went and grabbed dinner and by the time we got back they had cooled out, gave them a good curry and then threw them back out. Sunday I managed to go to the barn again. I spent an extra long time on warm-up since I figured he would be pretty sore, but again he suprised me and wasbasically bouncing along to the indoor. He was full of energy and was really using his body during the short ride. 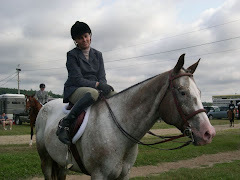 I didn't want to do too much jumping since we had a hard ride the day before so we worked on lengthening and shortening trot and canter, and just the quality of the gaits. He was soft and responsive and I left the ride feeling really good. Yesterday I had off from work due to the holiday so I wanted to have a "fun" ride on Possum. We went down in the indoor to warm-up. A bunch of people were riding so we did our usual flat and then hopped over some smaller jumps. Then I took Possum down the road to have a good gallop. The conditions were perfect, the temps were above freezing and that made the dirt road soft and slightly wet. As soon as I got up in my half seat he shot forward. I stayed as still as I could while his legs worked like pistons. His ears were pinned and his head kept reaching for more, like the finish lie was going to approach at any minute. I love that feeling of going so fact that it takes your breath away. Before I knew it we were running out of running room and I started to ease him up. I let him trot out for a bit and he snorted and blew through his nose. I think he was happy too to get out and stretch his legs, it has been a long time since we had a full out gallop. We walked the rest of the way home to cool out and just enjoy the scenery. When we got back I rubbed him down and then threw him back outside. I left the barn to go to my friends barn were we ended up going on a sunset trail ride. It was the perfect ending to a perfect weekend. The sky was so red and pink right before dark, and the air was still and cold with the only sounds being the crunching of the horses in the snow and their tense breaths. It was one of those riedes that you breath deep and am thankful just to be alive and enjoy this greatness. For a split second it made me forget that I didn't have a guy to share it with and was totally content in just being in the moment.